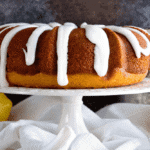 Tender, Homemade Lemon Pound Cake with a Delicious Lemon Frosting! Blend all ingredients for cake in a large mixing bowl and beat with electric mixer for 2 minutes. Pour into bundt pan. Bake for 45-55 minutes or until tests done. Cool 25 minutes then invert onto cake rack. Cool Completely. In a medium size mixing bowl combine powdered sugar and lemon juice. Drizzle over cake.